HOUSTON – A piece of foam debris that detached from the space shuttle Discovery's fuel tank and may have struck the orbiter during its Thursday launch poses no threat to the spacecraft or its astronaut crew, NASA officials said today (Feb. 25). "The foam liberated at a time when it's relatively late in the [flight] profile, and well past our time of concern," said LeRoy Cain, NASA's mission management team chair. Discovery blasted off from the Kennedy Space Center in Cape Canaveral, Fla., yesterday at 4:53 p.m. EST (2153 GMT). The foam piece — which officials said measured roughly 8 by 10 inches (20 by 25 centimeters) — came off the space shuttle's external tank at around 3 minutes and 51 seconds after launch. Preliminary analysis showed that the foam chunk may have hit the bottom part of the orbiter as it fell into the plume of the shuttle's main engines. But NASA officials said the debris impact is not much of a worry. It occurred well after the aerodynamically sensitive time when such foam loss could have seriously damaged the shuttle as it rocketed into the upper atmosphere. Cain said that Discovery's crewmembers will continue to perform all the normal debris inspections to make sure the vehicle is safe. Today, the astronauts spent most of the day carrying out assessments of the shuttle's thermal protection system. Heat shield surveys have been a standard part of every NASA shuttle flight since the 2003 loss of the shuttle Columbia and its crew. 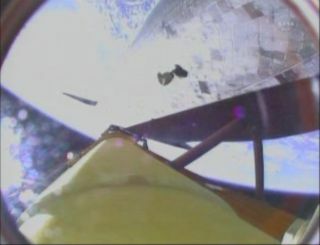 Columbia broke apart on re-entry as a result of wing damage incurred by a foam impact. Still, Cain noted that Discovery's external tank, which underwent a series of modifications after cracks were discovered on key structural points following the shuttle's scrubbed launch attempt on Nov. 5, performed well. "Overall, the performance of [the tank] was really exceptional," Cain said. "From a preliminary standpoint, things look really good for all the space shuttle elements. Discovery is performing very, very well in orbit." The space shuttle Discovery is flying an 11-day mission to the International Space Station to deliver a new storage room and a humanoid robot named Robonaut 2 to the station. The shuttle is slated to arrive at the orbiting outpost tomorrow (Feb. 26) at 2:19 p.m. EST (1919 GMT). "All is going very well, the systems are behaving very well," said Bryan Lunney, lead flight director for Discovery's STS-133 mission. "The vehicle is in great shape – no notable anomalies to talk about. Everything is going well there, and we're ready for our rendezvous tomorrow."